Vortex Optics designed and built the 6-24x50 Diamondback Tactical Riflescope to meet the needs of tactical professionals, but with easy usability for hunters. Its broad zoom range makes it ideal for mid- to long-range use, while the 50mm objective draws in the large amount of light required to keep views bright and clear in challenging conditions—such as during the dawn and dusk hours—or when focusing on small subjects at long range with the magnification dialed to maximum. Extra-low dispersion XD glass and anti-reflection fully multi-coated optical surfaces complement the magnification range and objective by transmitting bright and clear high-contrast views with accurate color and improved edge-to-edge contrast and resolution. The scope is based on the MOA scale, with exposed tactical finger-adjustable turrets for fast impact point correction in the field. Windage and elevation adjustments are made at 1/4 MOA per click with 15 MOA travel per rotation and a broad 65 MOA range available. The tactical EBR-2C reticle, placed on the first focal plane, maintains its subtensions at all magnifications to make corrections without having to touch the turrets or to estimate the range to and size of your targets. The scope is parallax-free to 10 yards, with a side adjustment correction turret for distances from 10 yards to infinity. Its sturdy 30mm one-piece maintube provides a solid platform for the internal mechanisms and is made of a lightweight and durable aluminum alloy that has been treated with a scratch-resistant low-reflectivity matte black anodized finish. To withstand the rigors of heavy outdoor use in all weather conditions, the optical tube is nitrogen filled and O-ring sealed to be waterproof and resistant to internal fogging. 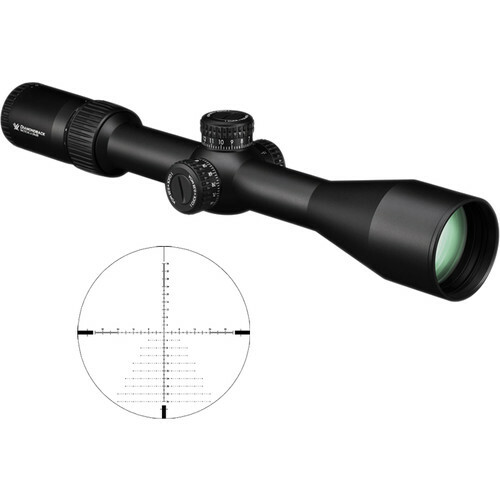 Box Dimensions (LxWxH) 19.5 x 4.0 x 3.75"
6-24x50 Diamondback Tactical Riflescope (EBR-2C MOA Reticle) is rated 5.0 out of 5 by 1. Rated 5 out of 5 by Gabriel from Satisfied customer As always, Vortex is Top Notch. The customer service at B&H was excellent. I made this purchase over the phone. The sales rep. was super informative and very friendly. I will definitely do business with these guys again.